A few weeks ago I got bronchitis. I don’t get sick often, but sometimes you just pound it too hard and the body craps out. However, it was not the right time to take off from work, which statement is probably a clear indicator of how crazed about work our American society is (And how I have become). “Yeah, I am on death’s door, but I gotta go to work.” Heavy sigh followed by a hacking, wracking cough. Wipe nose on sleeve. Carry on. And I was one of at least two in our department who were in the same boat. Ah well. In my next iteration, I will go back to being Mediterranean or Caribbean in my approach. It is much better. Anyhoo, by the time I stumbled home and crawled up the stairs on one of the worst days, I wasn’t up for much cooking. I was, however, very much in the mood for a comforting, nourishing soup. So was my mom, who was in similar condition downstairs. That is when knowing your way around a kitchen is a good thing. If you can chop, saute, and add flavorful liquids, in about 25 minutes you can have a soup that may not raise the dead, but will smell good, taste good (if you have any sense of smell or taste left) and make you feel better. If you don’t have any sense of smell or taste, just load on the hot sauce and enjoy a few minutes of steamed and spicy relief. Feel like you can’t even deal with chopping fresh vegetables? Go ahead, empty out all the useless quarter bags of frozen vegetables buried in the back of the freezer. The tomatoe-y broth and herbs will make it all taste good, even if the texture leaves a bit to be desired. 1 quart your preferred stock, plus more liquid to cover – can be stock or water*. In a deep soup pot, heat the oil at medium high until loose and fragrant. Add onions, stir to coat, and lower heat to medium. Add garlic, carrots, and celery, and saute for five minutes, until becoming tender. Add additional vegetables, stir to coat and sauté another three minutes. Add tomatoes and broth, plus enough additional liquid to cover, bring pot to boil, then lower heat and simmer for ten minutes. With about five minutes left in the simmer, add beans, and optional pasta and spinach, and seasoning. Serve with saltines or crusty bread. I agree with the Chica that soup is the perfect healer. I make a pot a week (always farm fresh). Gracias por la receta,la tendre pendiente para uno de estos dias que no haga mucho calor. Ahora en Puerto Rico comenzando el verano 92 grados F. Espero estes recuperada de la bronquitis. Saludos!! 92!?! Wao, ni lo puedo imaginar…en junio! Gracias por la receta, la tendre pendiente para uno de estos dias que no haga mucho calor. Ahora, en Puerto Rico 92 grados F., y comenzando el mes de junio (o sea, el verano). Saludos!! No puedo creer que ya está a 90! 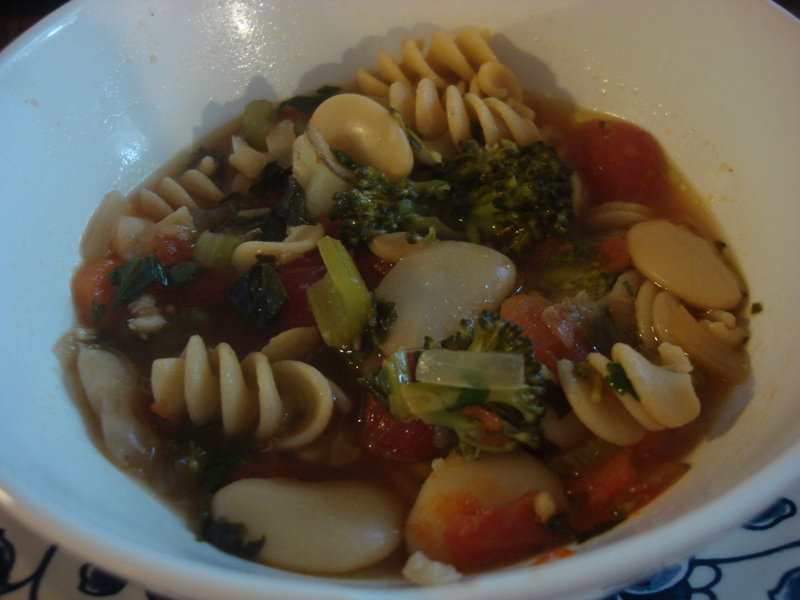 Wao…..
Soup is the perfect healer! I am off to London in 2 days to look after a friend who is convalescing from an op and she has asked me to make her lots of soup! Have a safe trip and I hope she feels better soon so you can go out to eat in London together! 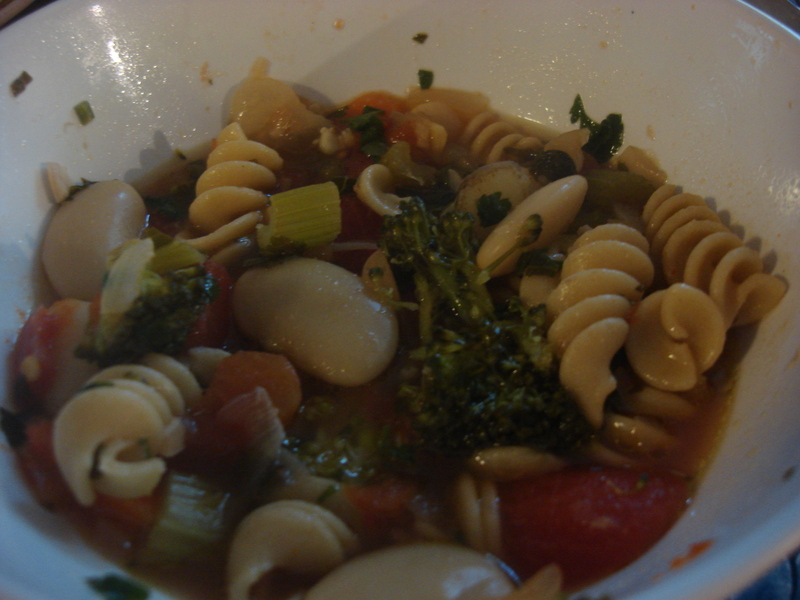 A hot bowl of soup always makes me feel better, especially when it is homemade. Happy that you are feeling better. Thanks Karen! Now that I am feeling better and the weather is warming up, I think I’ll be looking into cod soups as well!